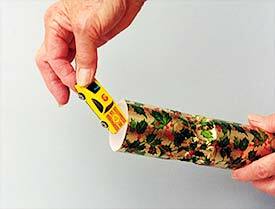 The following set of instructions and supporting videos provide step by step directions for making your very own Christmas Crackers (or Wedding Crackers)! The finished cracker will be approximately 10 inches in length and have a fillable space measuring 2 inches in diameter by 4 inches in length. 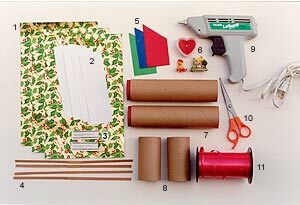 Most of the materials and equipment needed to make your own crackers can be purchased at craft and stationary stores. 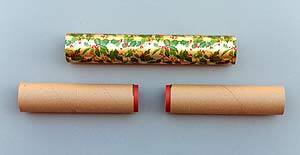 The more difficult to find materials including tissue paper hats, cracker snaps, cardboard tubes, and rollers (see the photograph below) are available for purchase on our DIY Cracker Supplies page. We encourage you to contact us with any questions you might have about making your own Christmas Crackers when following our instructions and using our materials. 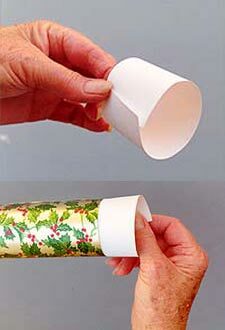 Wrapping paper (cut to 7.5 x 12 inches) — crackers made with lighter weight papers will tear apart easier when pulled. Stiffener ends (cut into 2.25 x 7 inches — use 60-70 weight white card stock, such as 67# Exact Vellum Bristol. Small gifts or novelty items (at least one per cracker). Cardboard tubes (2 x 4 inches). 1 — Insert rollers into ends of cardboard tube (if fit between tube and roller is not snug enough, add a little masking tape to smaller (red) end of roller). 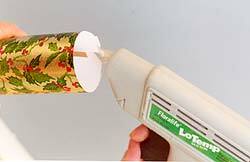 2 — Lay roller-tube assembly on back of wrapping paper making certain tube is centered across length of paper. 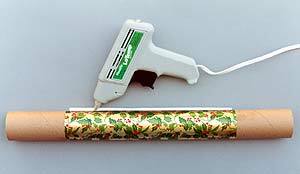 Apply a small drop of glue from glue gun to bottom middle edge of paper and roll tube back over glue. 3 — Place snap under front (leading) edge of roller-tube assembly, making certain snap is centered across length of paper. 4 — Roll paper onto roller-tube assembly to within a half inch or so of paper’s end. 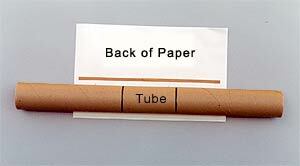 Make certain paper rolls evenly (straight) onto tube. 5 — With glue gun, run a narrow bead of glue along back of paper about a quarter inch in from top edge. Roll paper over glue keeping glued seam pressed against work surface for several seconds to allow glue to harden (placement of glue bead may have to be adjusted slightly inward if glue flows out of seam onto outer surface of wrapping paper). 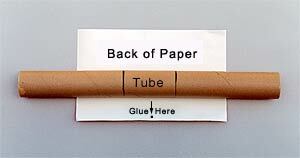 6 — While holding paper cylinder in middle (one hand grasping cardboard tube), remove roller from each end of cylinder. 7 — Roll stiffener end into slightly smaller diameter cylinder than cracker and insert into end of cracker until even with outer edge. Do not cover snap during this procedure — it must remain free in end of cracker. 8 — Spread stiffener out firmly against inside wall of cracker end and glue into place with glue gun. 9 — Repeat step 8 on other end of cracker. 10 — Using thumb and forefinger, crimp (gather) one end of cracker between tube and reinforced (stiffened) end. 11 — Securely tie a 10 – 12 inch length of curling ribbon onto the gather of the cracker using a double knot. Then clip off the loose ribbon ends. 12 — Insert gifts/messages into open end of the cracker. The fillable central part of the cracker measures 2 inches in diameter by 4 inches in length. Your items must fit comfortably into this space in order for the cracker to be closed and finished. When filling your crackers, make certain you do not push the cracker snap into the center of the cracker. 13 — Repeat steps 11 and 12 for open end of cracker. 14 — Check the finished end of the cracker to make certain the snap is located near the outer rim of the cracker and not too far down into the cylinder. Reposition with fingers as necessary. Your cracker is now finished and ready to be shared with your party guests. 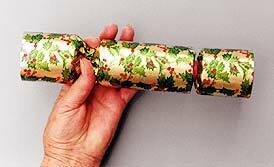 Some practice is usually required to make a consistently well-wrapped and formed cracker. Techniques such as the one described above using solid core centers, rollers, and stiffened ends have been found by many people to be among the easiest methods for making nice looking crackers. 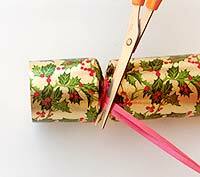 The following two videos show how to make and decorate your own Christmas crackers.